I kid because I love. 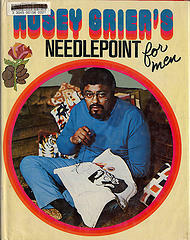 God bless Grier for being mature enough to not only stick with the name ‘Rosie’ but to also publish a book on needlepoint. He’s was a bigger guy than I am. And at 300 lbs, I do mean that literally. Speaking of 300 lb. linebackers, that probably explains why few people gave him a hard time about this avocation. His other love was beating the pulp out of an offensive line. Makes me wonder how many people ended up attending the Rosie Grier School of Embroidery more out of a healthy sense of respect for his reputation on the gridiron than out of a, shall we say, ‘love of the game’. Although Grier’s passion for needlepoint was key in the demise of the Rams leaving, let’s not forget that his teammate, Merlin Olson, was the spokesman for FTD Flowers, as well as a regular on “Little House on the Prarie.” That had to count for something, didn’t it? Good point. Hmmm, maybe Grier and Olson should have switched jobs. After all, with a name like ROSIE you’d think he’d be the perfect candidate for talking about flowers.